Florida Health Care Association members continue to do an excellent job with educating legislators and political candidates about the important work they do. For the past several months, FHCA members have hosted over 100 facility tours, connecting legislators and candidates with residents and staff so they can see, first hand, the high-quality care being delivered and how dynamic facilities have become in serving the needs of both short and long term care patients. 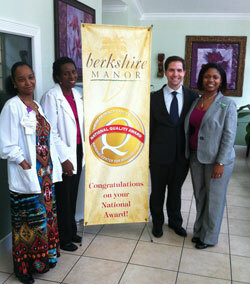 Last Friday, John Couriel, Republican candidate for Senate District 35, visited Berkshire Manor in North Miami, giving administrator JeNell Shephard and the staff an excellent opportunity to showcase the award-worthy quality care the facility is delivering. 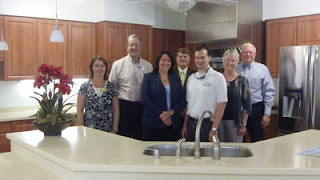 Florida Presbyterian Homes in Lakeland, which is preparing to open a new assisted living facility, hosted Representatives Kelli Stargel and Seth McKeel, as well as representatives from the Pioneer Network and other long term care stakeholder groups. Administrator Maria Rivera, Executive Director John Hehn, together with FPH Chair Harry Pettit and other staff, joined these special visitors for a discussion of senior care issues. They also enjoyed lunch in one of the new family-style kitchen and dining areas in the new building. Recent media coverage and opinion pieces on the Department of Justice's report related to children being cared for in nursing homes is another unfortunate attempt to demonize these facilities in the press. There are only six out of 685 nursing homes in Florida which specialize in serving children and young adults. The unfortunate reality is that these pediatric facilities are the safety net for children who cannot be cared for at home because either their medical needs are too complex or they have no family to rely on. “Fragile” does not begin to describe their care needs – they require ventilators, feeding tubes; they have traumatic brain injuries or may even be comatose. The staff dedicated to providing their 24-hour care is specifically trained in pediatrics. They include registered nurses, physicians, respiratory therapists, speech therapists, dieticians and social workers, to name a few. The reality is that good care costs money, as do the support services to ensure these children are given a nurturing and home-like environment. Medicaid doesn’t come close to covering the costs for what these children need, like 24-hour pulse and oxygen monitoring, specialized wheelchairs, off-campus outings with all the necessary staff so they can experience what it’s like to be a kid. Yet, despite a chronic funding shortfall, nursing homes continue to do all that it takes to deliver high-quality, compassionate care to those who need it most. Pediatric nursing homes have a very specific set of requirements and regulations to care for children 21 and under. The areas where these children live are separate and secure, and yes, isolated away from the geriatric residents; however, they are designed specifically for children. You’ll find handicap-accessible playgrounds, toys, stuffed animals and a brightly-colored, kid-friendly living environment. Education is an important component, and through collaboration among the families, medical team and school system, each child’s schooling needs are met. You’ll also find more than twice the number of staffing hours per child than that which is required for seniors. In many cases, staff are the only families these children know. They care for them and love them as if they were their own. Nursing homes have always been supportive of every individual receiving the most appropriate care in the safest and least restrictive settings, and we actively support programs that keep or safely transition these fragile children to a home and community-based setting. The unfortunate reality is that the DOJ report, and Mr. Grimm’s editorial, only focuses on the small fraction of children who are blessed to have a strong family support network. Many of these kids are there because someone in their life failed them, and their health deteriorated as a result. But just like they would with their own children, the staff working in these nursing homes experience joy and pride in their hearts when they see them thrive and, if they have somewhere safe to go, can return home. Wouldn’t our communities benefit if the news media took time to write about those stories and for once, give credit to these facilities for meeting an important need…I suppose those headlines wouldn’t be nearly as interesting though.